A newspaper article on President John F. Kennedy (1917-1963)'s visit to Cape Canaveral Air Force Station Launch Complex 14 (LC-14) on September 11, 1962. Presidents typically use such visits to gain firsthand understanding of important programs. President Kennedy toured the Cape Canaveral launch facilities the day before he announced the project to place a man on the Moon. PRESIDENTIAL VISIT - President Kennedy and Astronaut Schirra listen as B. G. MacNabb, GD/Astro director of operations at AMR, conducts briefing of Complex 14, Cape Canaveral. President met key Astro men there, shook hands with many in work force. Original newspaper article: "GD/Astro Greeters See Kennedy on Cape Trip." September 11, 1962: Private Collection of Dr. Calvin D. Fowler. 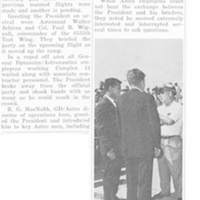 Digital reproduction of original newspaper article: "GD/Astro Greeters See Kennedy on Cape Trip." September 11, 1962.
; 6555th Aerospace Test Group; AMR; astronauts; B. G. MacNabb; Cal Fowler; Calvin D. Fowler; Cape Canaveral; Cape Canaveral AFS; Cape Canaveral Air Force Station; Cape Skid Skip; GDA; General Dynamics/Astronautics; Glenn, John Herschel, Jr.; Jack Kennedy; JFK; John F. Kennedy; John Fitzgerald Kennedy; Launch Complex 14; LC-14; Malcolm Scott Carpenter; Mercury; Mercury-Atlas; NASA; National Aeronautics and Space Administration; outer space; Paul R. Wignall; presidents; Scott Carpenter; Skid Strip; space exploration; space programs; T. J. O'Malley; Thomas Joseph O'Malley; Tom O’Malley; Wally Schirra; Walter Marty Schirra, Jr.
“GD/Astro Greeters See Kennedy on Cape Trip.” RICHES of Central Florida accessed April 23, 2019, https://richesmi.cah.ucf.edu/omeka/items/show/4966.